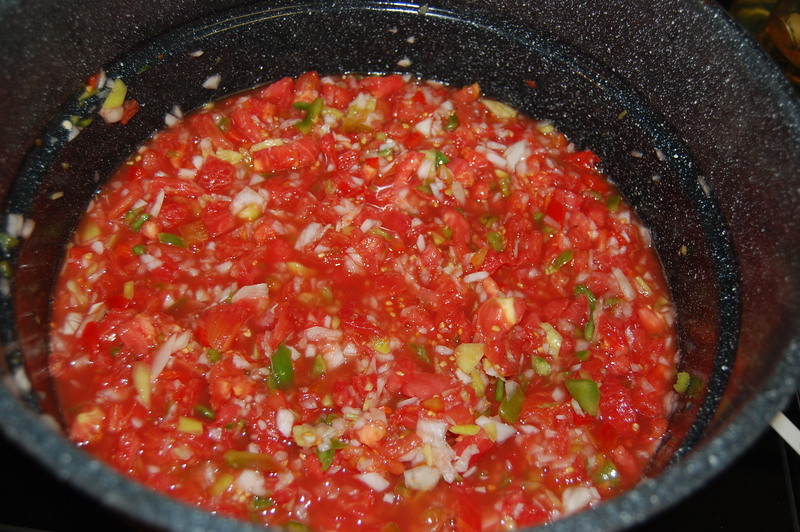 This is an easy recipe for making Salsa. I have been using this recipe for years and it never fails to bring praise and request year after year. This is a single batch recipe and will make about 6 pints. I usually double this recipe. 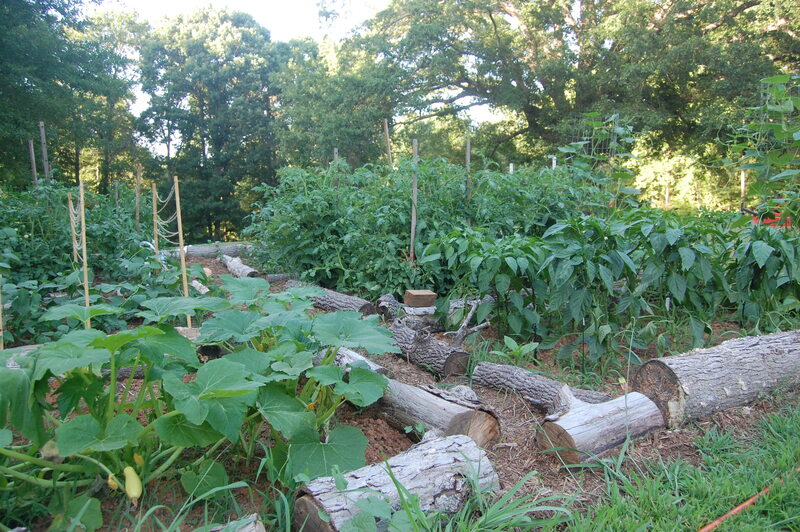 A lot of it depends on whats coming out of the garden. After this batch, I have put up a total of 37 pints of salsa this year. Core and peel tomatoes as shown in my earlier post (Canning and Canning some more). I choose to hand chop my tomatoes. I like my salsa chunky and I have found that I don’t have as much control using a food processor. 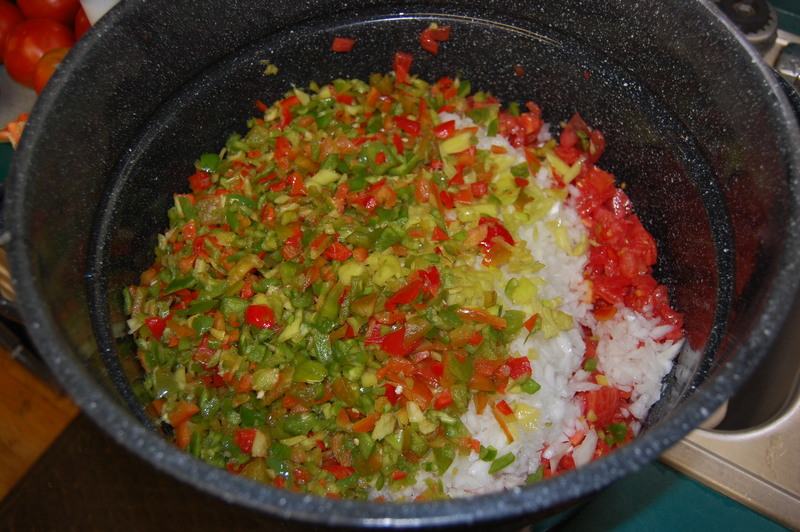 I use bell pepper, banana pepper, and jalapeno peppers in my salsa. 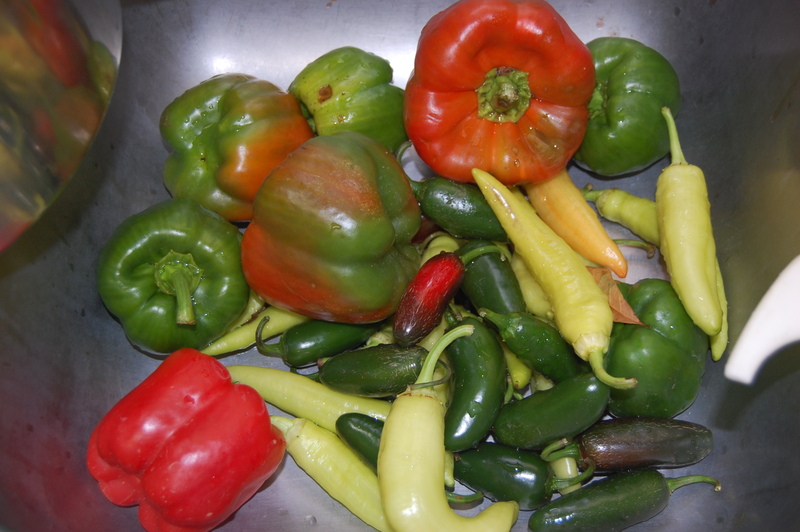 Remove the seeds from peppers, rinse each pepper to wash away any seeds. Also, make sure to remove the white innards of the peppers too. Chop peppers to your desired consistency. 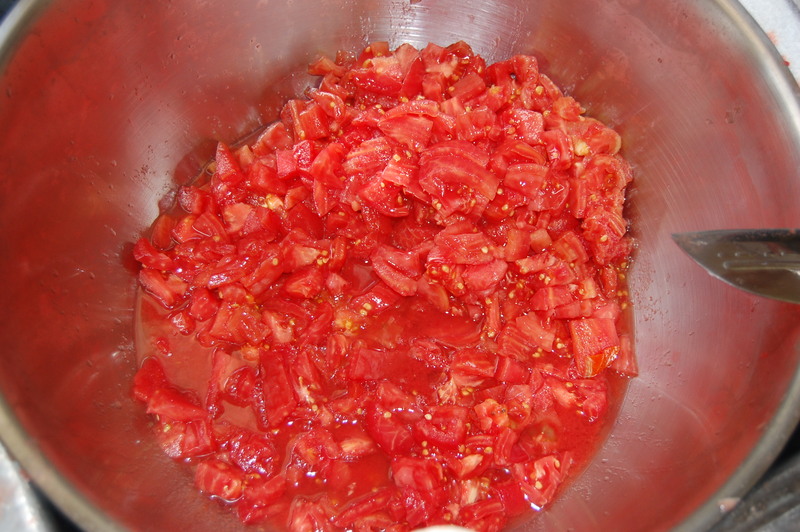 Combine diced tomatoes, onions and pepper in a large pot. Add apple cider vinegar and salt to veggies and simmer for 10 minutes. Dip into sterilized jars, seal and cook in a hot bath for 10 minutes. Viola!!!! End of Summer Salsa. This is a great way to enjoy your garden all winter long. I take it to the Carolina/Clemson party we have each year which is near Thanksgiving and folks are amazed that its homemade from last years garden. Enjoy! 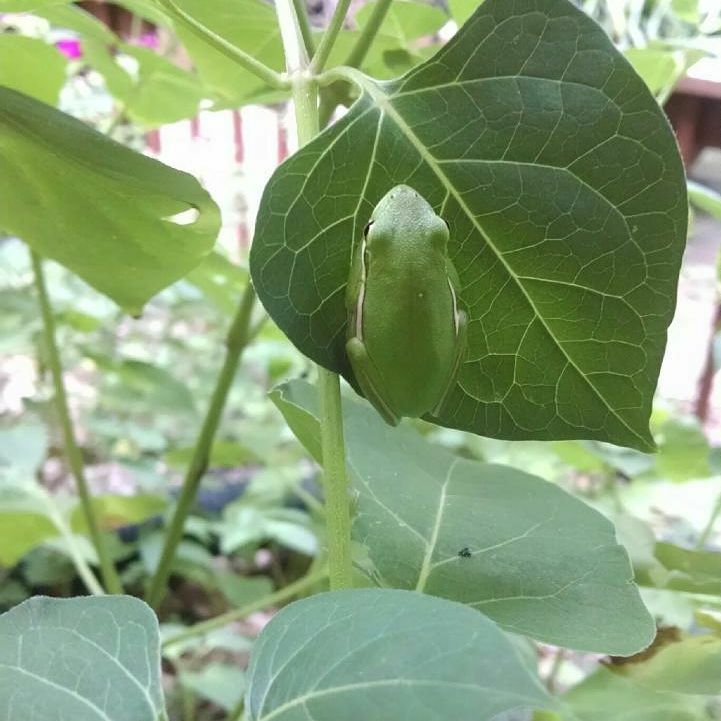 Jimmy the tree frog resting on a Four O’Clock leaf. My little winged friend lovin on a zinna. 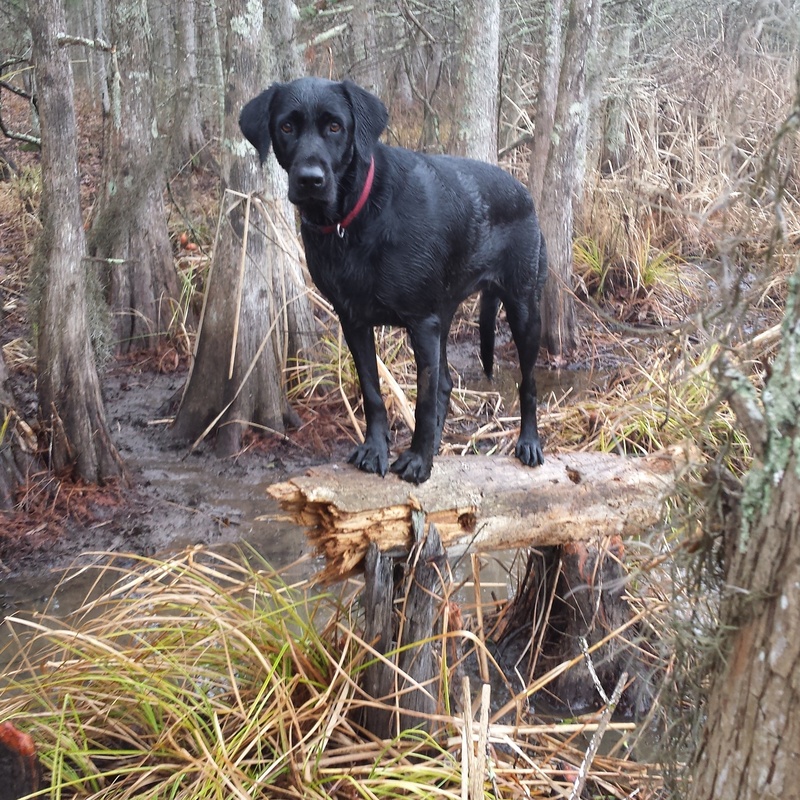 Lil Gem on a log she found while ducking hunting last year. 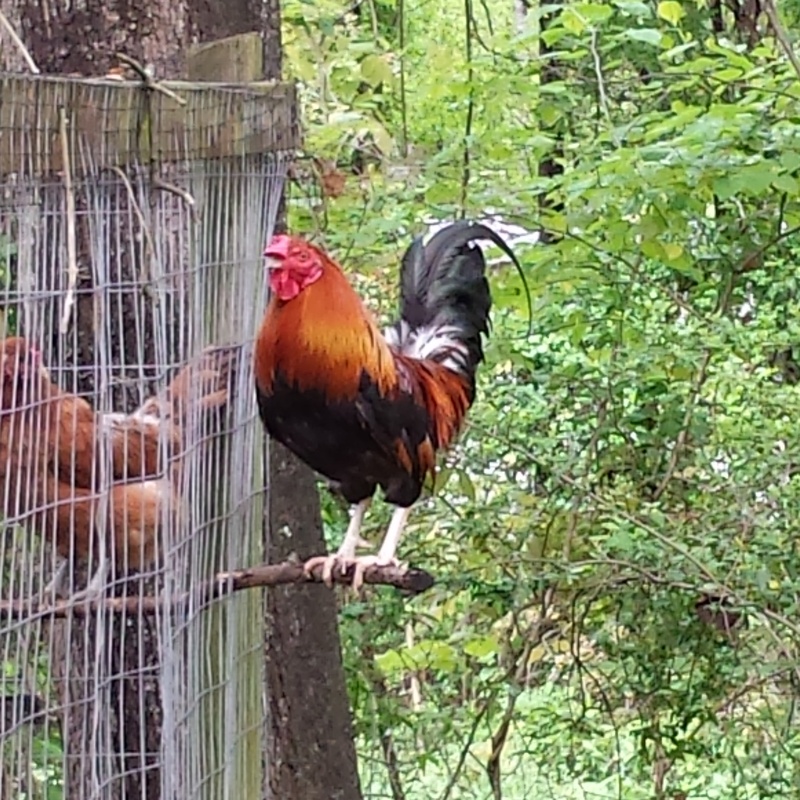 Cocky the Red Jungle Fowl! 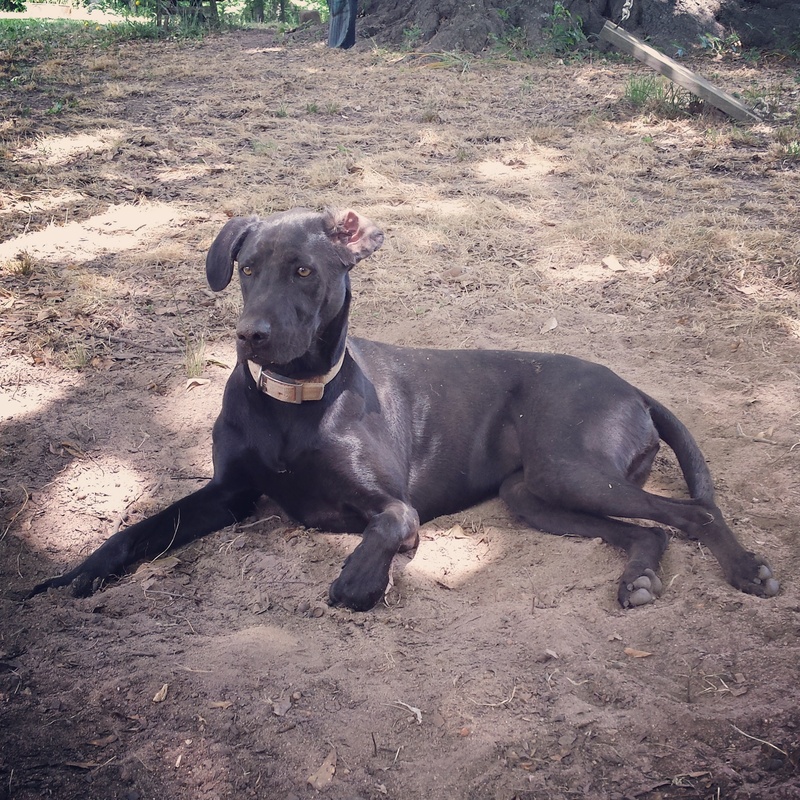 Sleek and elegant Soot the squirrel huntress. Fastest canine in the world. Canning and Canning some more!!! Marion and Rutgers tomatoes are some of the best tomato plants for producing the perfect canning tomatoes. The fruit of my labor is evident. This is one of my favorite times of the year, after planting season, I love the harvest. 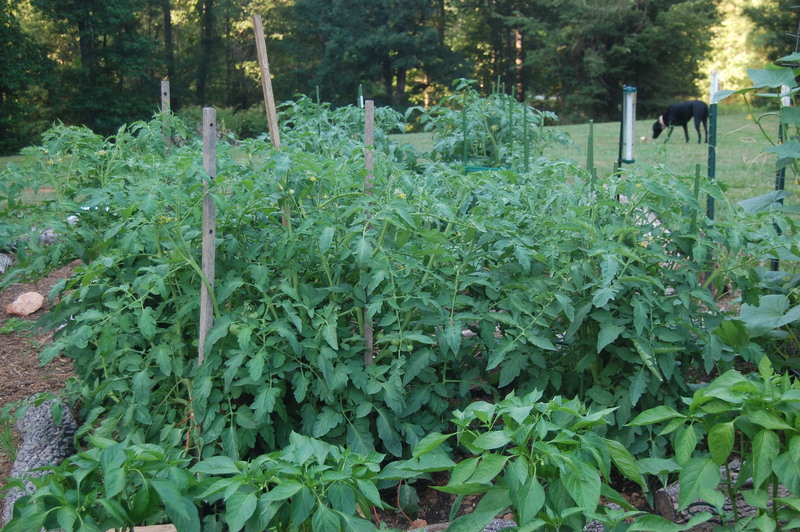 I planted 24 tomato plants this year. 9 rutgers and 9 marions and 6 heirloom. 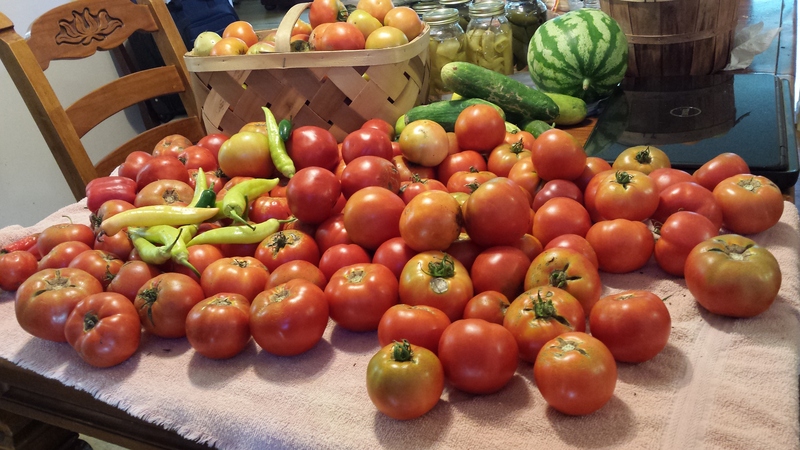 When you plant tomatoes, plant enough to give yourself some options for canning. What a versatile fruit, the tomato. 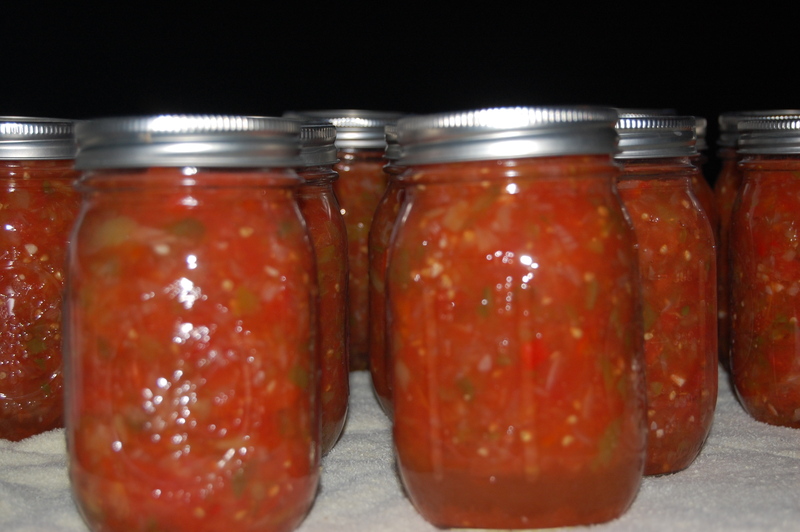 So far this year I have made 3 batches of salsa, each one a little different and I have also canned 15 quarts of whole tomatoes. My next project hopefully will be spaghetti sauce. Before you can do anything with your tomatoes you must first core and skin them. Below is a quick guide to do that. 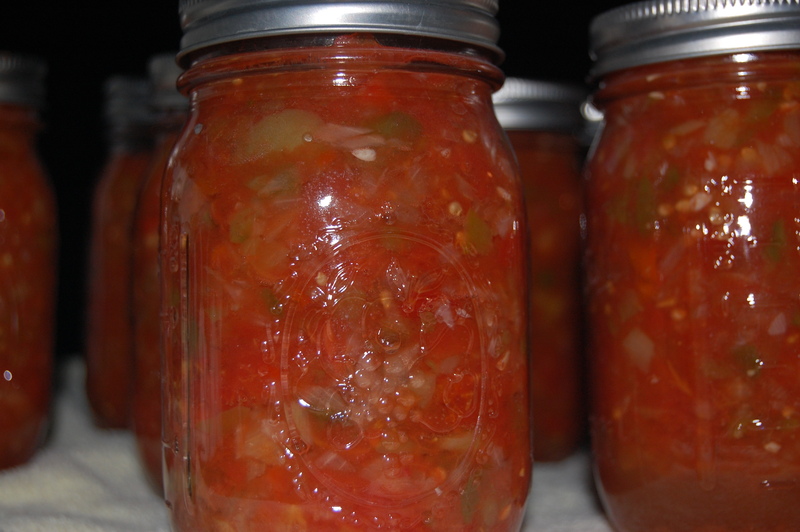 This is the first step to preserving your tomatoes whether canning or freezing. You will need the following items to make the process easier for you. Wash your sink and counters tops before you begin any canning process. Bacteria is NOT your friend. So take every precaution to get rid of bacteria. Personally, I’m a big fan of bleach, but if you don’t like bleach you can use soap, water and vinegar. Wash your fruit. Make sure to remove any dried leaves or soil from each tomato. 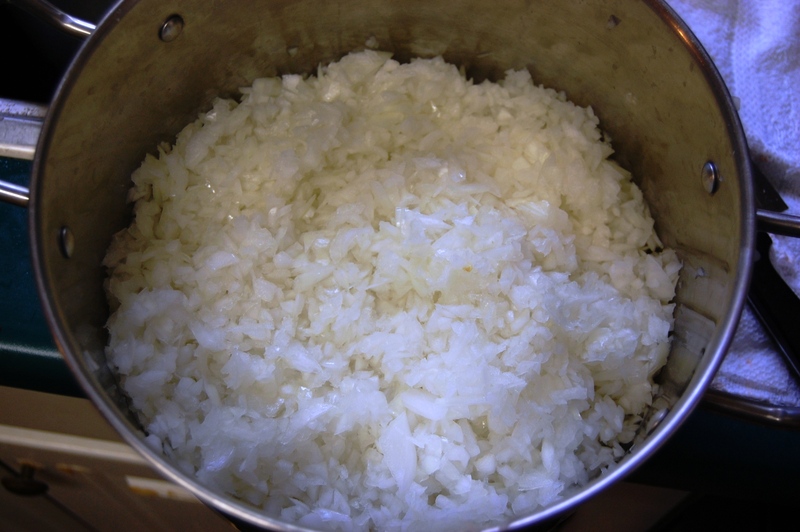 Fill your large pot half full of water and bring to a full rolling boil. Once tomatoes have been washed drop them into the boiling water. Don’t over fill the pot. Leave tomatoes in water for 2 to 3 minutes and dip them out. 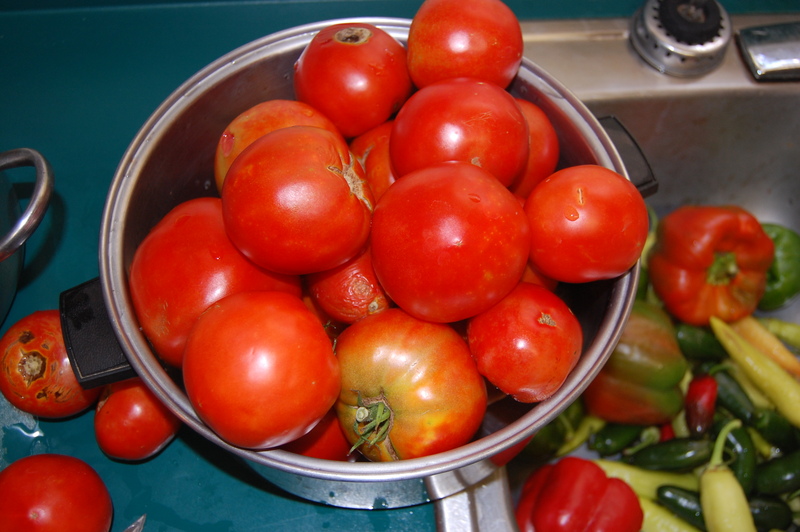 Fill the large bowl half way with cold water and drop the blanched tomatoes into the cold water. 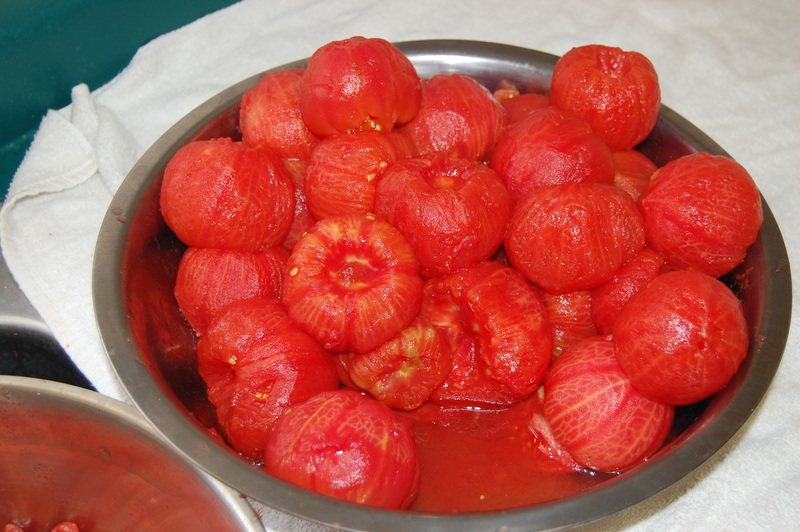 Continue this process until all tomatoes have been dipped into the boiling water. You will have to replace the cold water frequently to cool your tomatoes off. Take a tomato that has cooled off enough to handle. 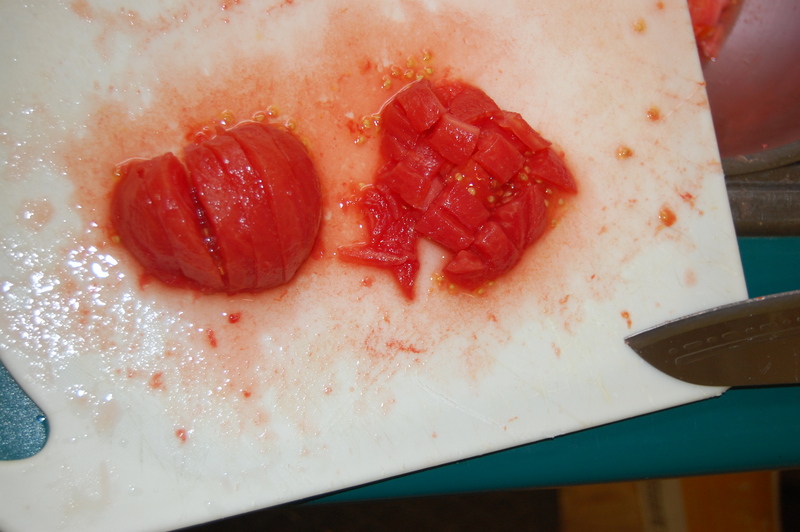 Use your parring knife to cut out the core which is the top of the tomato that attaches to the plant. The peel should come off easily. If the skin hasn’t already started to peel away make a small shallow slice around the tomato and the peel should come off. 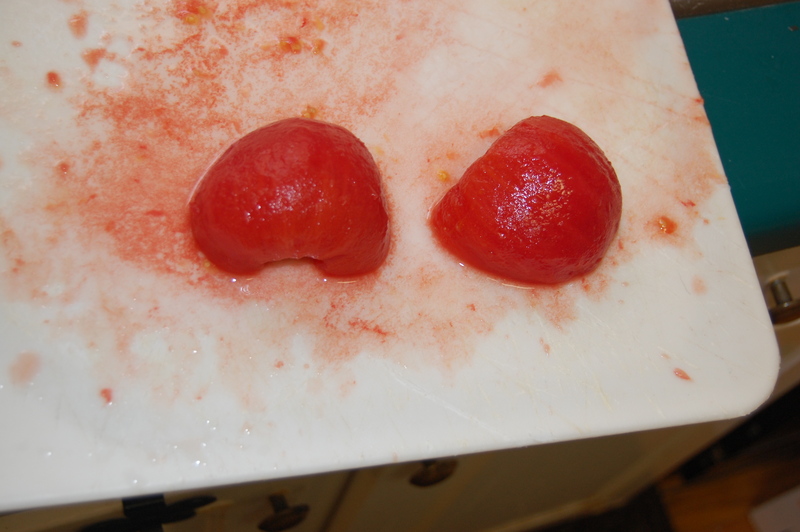 (if you find the skin hard to come off, leave the tomatoes in the boiling water a little longer). Continue coring and peeling until they are all finished. They should like like this. Now you are ready! You have many options once you get to this point. 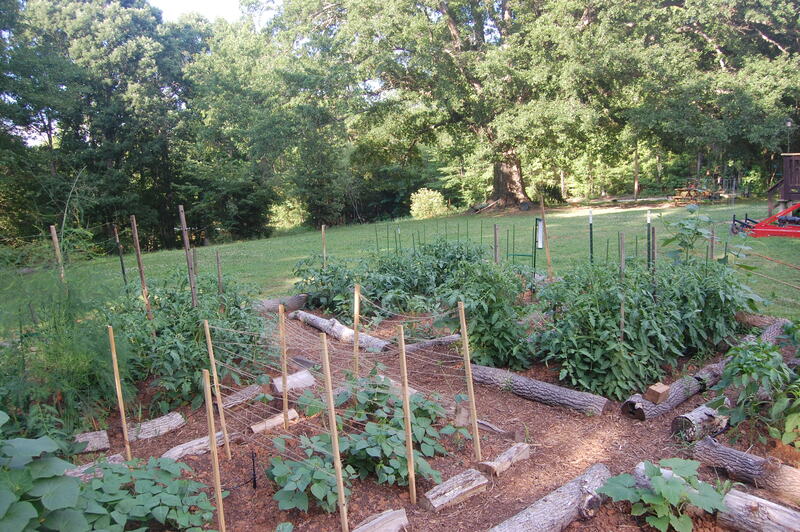 I have planted my garden in rows most of my gardening life. This year I decided I wanted raised beds. 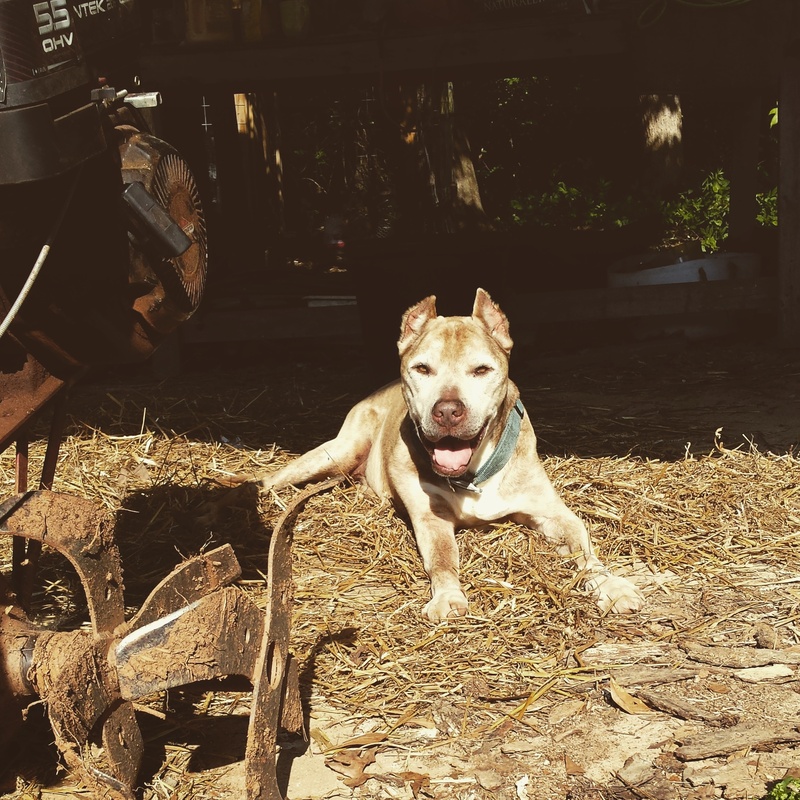 I’m older and weeding is no fun. My thought was I can better manage my weeding time by weeding a bed a day. Sounds good, Right? But, I didn’t want to spend my life saving on building raised beds. So I decide to recycle. I had three big sweet gum trees cut the year before and before the chain saw left the property, I had the trunks cut in 6′ and 8′ sections. 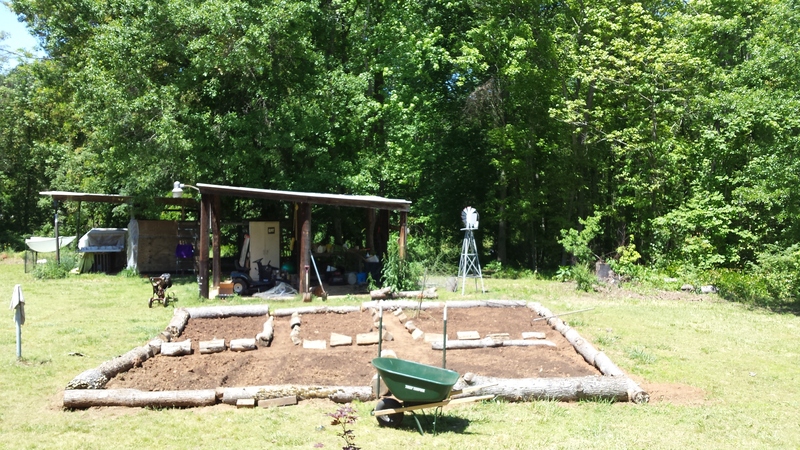 Used large sections of sweet gum tree trunks to outline the garden. 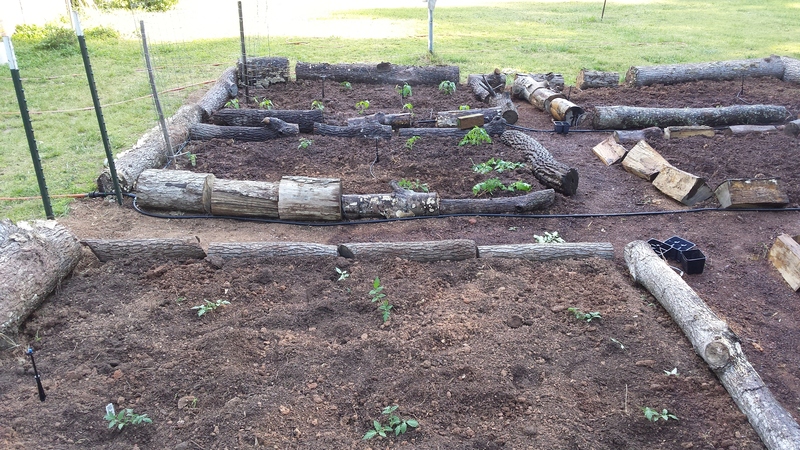 Used split wood to form the beds. Poor man will utilize whats on hand…so will a poor woman. Beds have been established and now the planting begins. This was a fun project and the materials didn’t cost me a dime. Gotta love free chicken poop , free soil, free trees and a little sweat equity, I am quite pleased with the turn out. 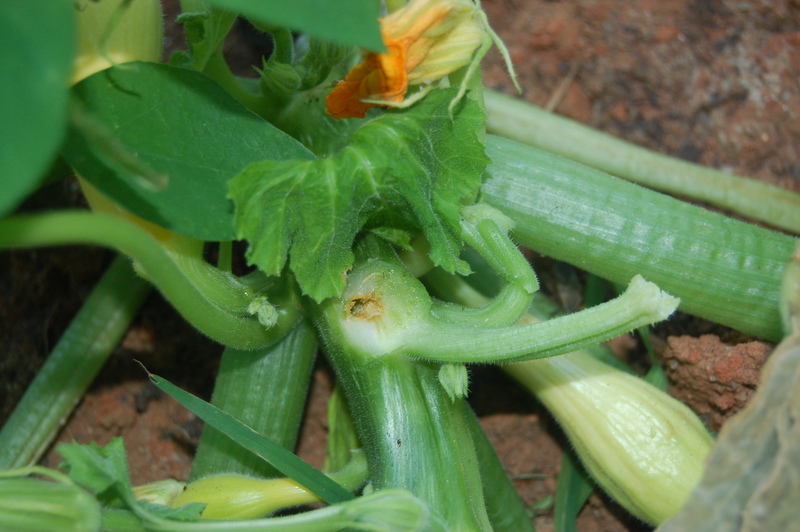 Summer Squash And The Insects That Love Them. 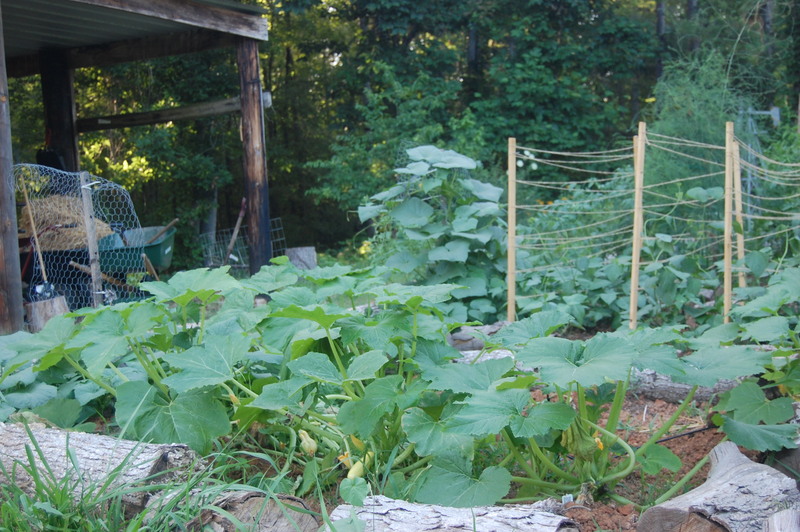 The squash is in full swing at One Squirrely Farm. 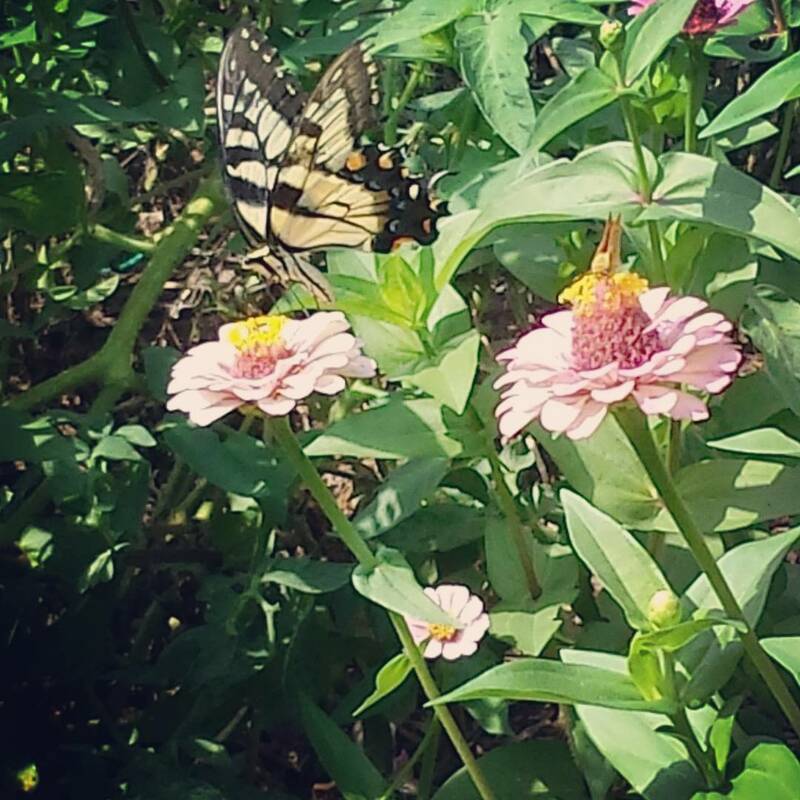 I walk through my garden daily to monitor each plant. I’m either picking ripe fruit or observing the health of the plants. I noticed the other day that one of my squash plants was looking poorly. Upon investigation I found the culprit, I think? Notice the wilting of the leaves towards the middle of the plant. Wilting leaves are a good indication that “Houston We Got a Problem”. This hole in the stalk is a big clue. 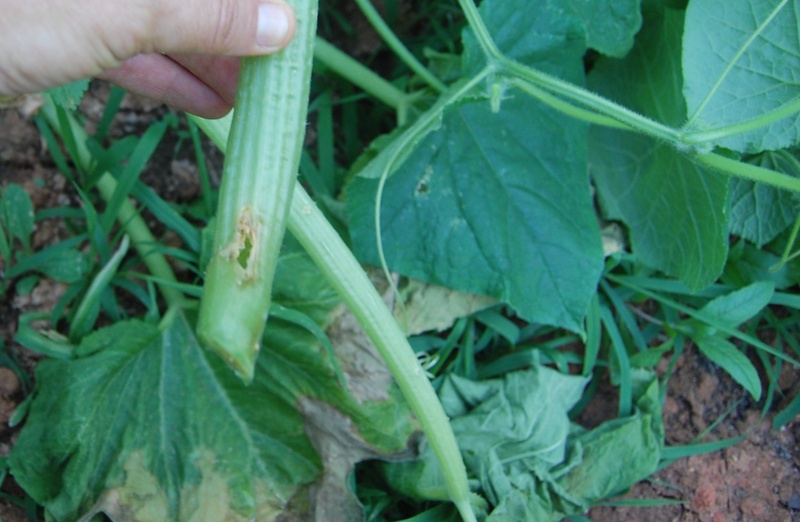 More signs of the squash vine borer. This hole in the stalk is from the Squash Vine Borer, Got Him!!! 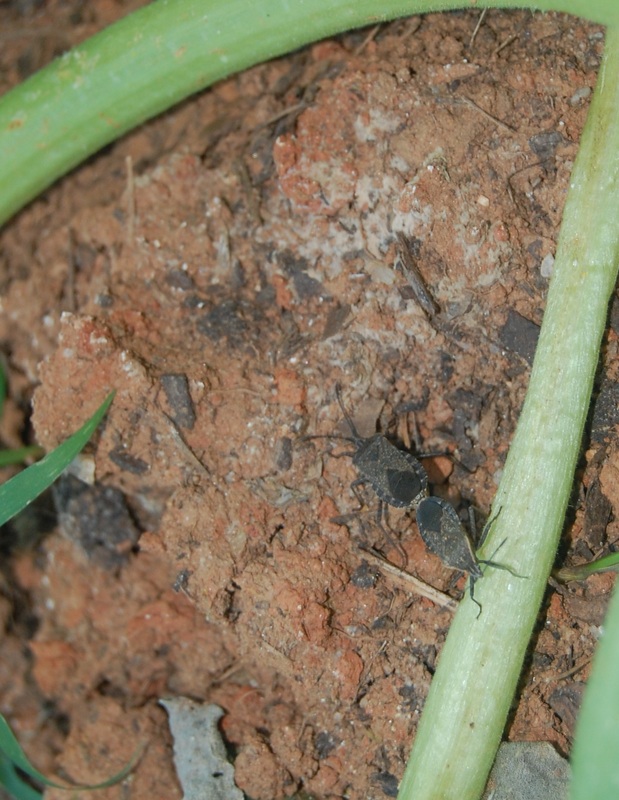 Or at least I thought…..
Its bad enough to find a stink bug, but to find a stink bug mating in your garden is even worse. So what to do? I try very hard each year to NOT use pesticides. I’d rather keep it organic, so I grab my handy container of (https://en.wikipedia.org/wiki/Diatomaceous_earth) Diatomaceous Earth. Diatomaceous Earth is natural but it will kill the good bugs too. So I was careful to sprinkle it at the base of the plant and the ground near the base of the plant, paying close attention to not get it on the blooms (don’t want to kill the bees). At last check the squash bugs had moved on, or hopefully died. The only way to kill the Vine borer is to cut off the effected stalk, cut the stalk and find the borer and kill them. Usually you can pack dirt around the area where the worm bored its way into the plant and it will recover. 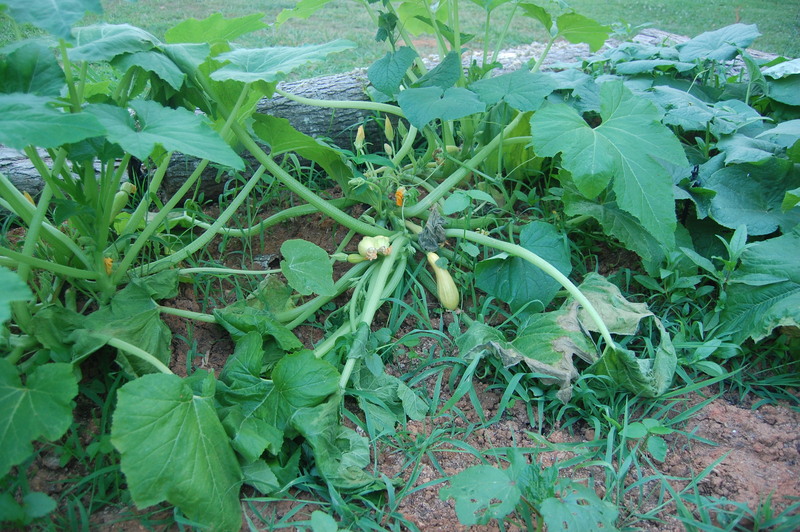 Pest in your garden is not the end of the world, once the squash plant has died out, I will clean up the remnants and put them in the burn pile, just in case someone left eggs for next years. Recently my daughter gave me a cutting of her Grandmother’s rose bush. (Her Grandmother on her Daddy’s side who is no longer with us.) Its an old fashion rose bush, unfortunately all we know is that is very old and the flowers are red. To begin, I cut the leaves off of the stem and cut the stem into 4 pieces. Make sure that the pieces that you use are straight thick stalks. Once cut, I took a knife and scraped one end of each cut stem just a little and then dipped the scraped end in growth hormone. I had already prepared my pot with loose dirt and made 4 holes twice as large as the stem. Why twice as large as the stem? 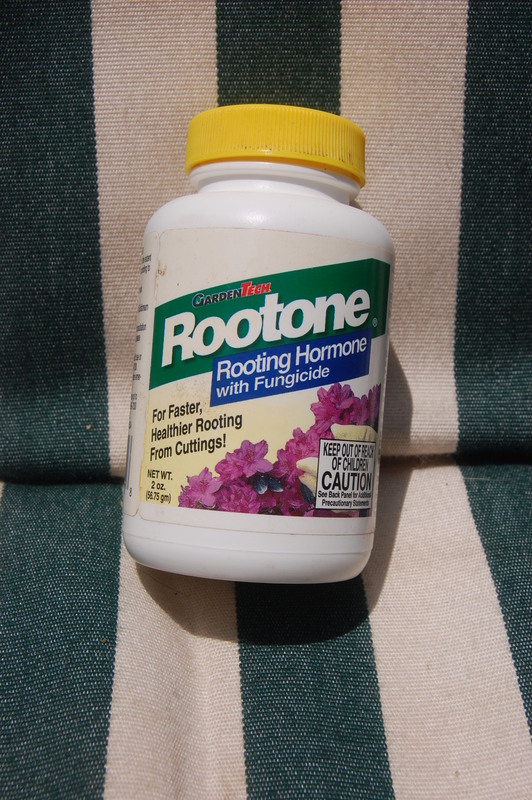 So when you put the stem in the hole it won’t knock off the growth hormone. Within a week I had results. 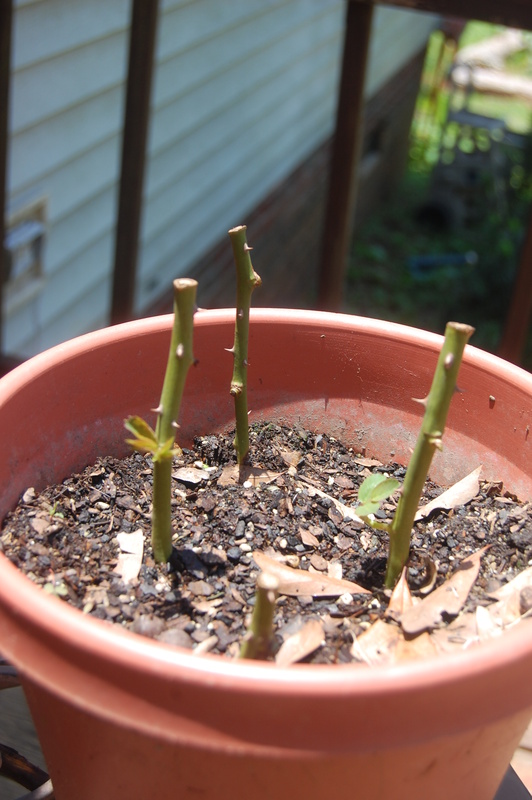 Notice the new shoots emerging from the stalks. I will give them more time to grow roots and then I will transplant to individual pots and eventually they will find there place in my garden. Tired and true and very easy.